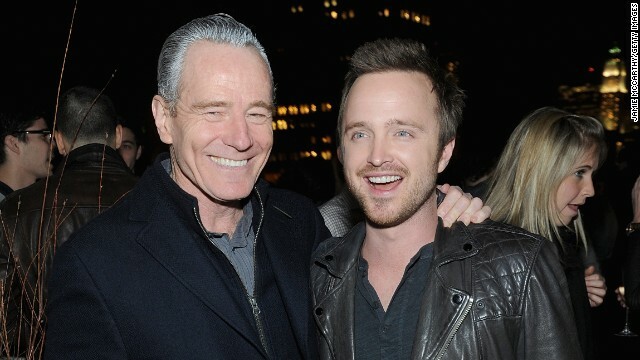 Aaron Paul and Bryan Cranston learned a lot while making AMC's iconic series "Breaking Bad" (like how to dissolve a body in acid, for example). But in between takes, Cranston also taught Paul a few things about relationships. And settle Paul did not. He waited for a woman he couldn't imagine living without, and he found that in Kind Campaign founder Lauren Parsekian. The pair, who married last May, are so simpatico that Paul claims they never fight. Paul may not feel so keen on communication after he reads the reviews for his new movie, "Need for Speed." Critics have slaughtered the video game adaptation, which is Paul's first role since his Emmy-winning turn in "Breaking Bad." The L.A. Times was disappointed "Need for Speed" didn't bring the same gas that's ignited the "Fast & Furious" franchise, noting that "'Speed' clocks in at a long two-plus hours and falls painfully short." USA Today, meanwhile, was troubled by the "film's glorification of street racing and its failure to address the collateral damage that comes in the wake of these high-octane contests." The New York Times' A.O. Scott didn't mind the ride, though. It's "an energetic, unpretentious B-movie" that's "devoted, above all, to the delivery of visceral, kinetic excitement." It seems very few have agreed with Mr. Scott. "Need for Speed" has been rated just 23 percent fresh - a.k.a., pretty rotten - on Rotten Tomatoes.